A cross between apartments and townhouses, the "stacked townhouse" is becoming a popular house type among DC-area homebuilders and buyers. While they're great for urban neighborhoods, a quirk in zoning means they're most common in far-flung suburbs. 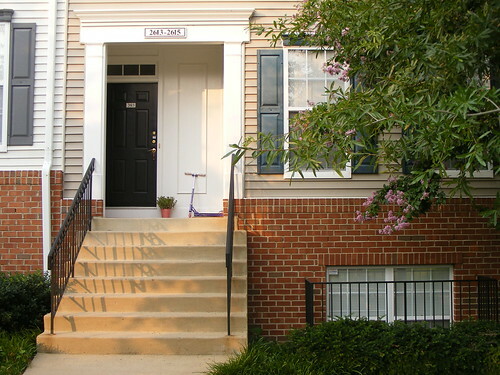 This townhouse in Arlington is actually two houses (note the two house numbers). All photos by the author unless noted. Also called a two-over-two or maisonette, the stacked townhouse is basically a rowhouse divided into two two-story units, one over the other. Both units have doors on the street, usually in a little alcove, making it look like it's one big house. The garages are tucked in back, on an alley. This house type is what some architects call the "missing middle," not quite a house, not quite an apartment, but a good alternative housing choice in places where the only options are a detached house or a high-rise. Historically, lots of cities have rowhouses divided into multiple apartments: Boston's triple-deckers, Chicago's two- and three-flats, Montreal's plexes. In those cases, each building generally has a single owner who rents out the other unit. They don't seem to have been common in DC. 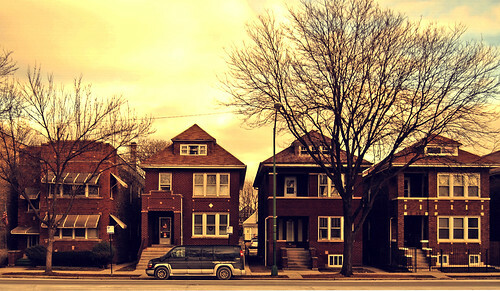 Two-flats in Chicago. Photo by Samuel A. Love on Flickr. Today's stacked townhouses are either sold individually as condos, or rented out as apartments in a larger complex. They've become popular in the DC area within the past 20 years for a couple of reasons. Builders like stacked townhouses because they take up the same amount of space as one townhouse, which saves on land and infrastructure costs. Unlike traditional apartment or condo buildings, these homes don't have lots of common hallways and lobbies that can be expensive to build and maintain. Stacked townhouses are also great because they provide the same amount of space and privacy as a townhouse at a lower price, which might enable buyers to live closer in than they could otherwise afford. 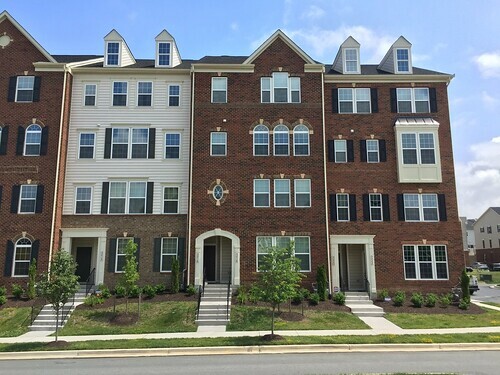 For instance, a stacked townhouse at Greenbelt Station in Prince George's County is currently selling for about $330,000, while a similarly-sized townhouse in the same development is selling for $70,000 more. Neighbors might like this house type because they look like big houses, allowing them to blend in with other residential buildings, including apartments, conventional townhomes, or even single-family homes. Stacked townhomes at Greenbelt Station in Greenbelt. Well, most of the time. These stacked townhomes at Greenbelt Station in Greenbelt have plain, flat exteriors which only emphasize their size, making them look bigger than they really are. But this is an aesthetic choice, and can be avoided. 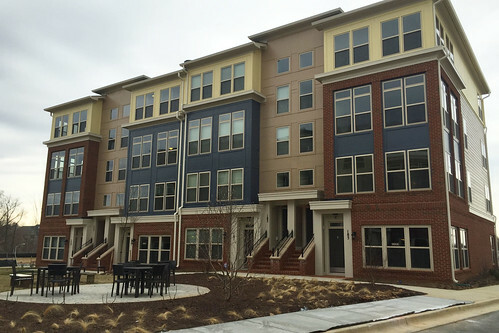 Stacked townhouses at Downtown Crown in Gaithersburg. Photo by the author. These stacked townhouses at Downtown Crown in Gaithersburg use different materials, colors, and bumpouts to break up what would otherwise be a big, four-story wall. It helps make the building feel smaller than it really is, while the individual doors for each unit add a bit of human scale. You'll find that stacked townhouses are pretty common in further-out suburban communities, from Frederick or Chantilly or Loudoun or Prince William counties. Whatever benefits stacked townhouses provide go away when they're in a car-bound place where residents have to drive everywhere. This happens because zoning in most communities outside the District (even close-in ones like Arlington) considers them apartments, meaning they can only get built in areas zoned for apartments. Where land values are really high, developers are more likely to just build a high-rise apartment building instead. 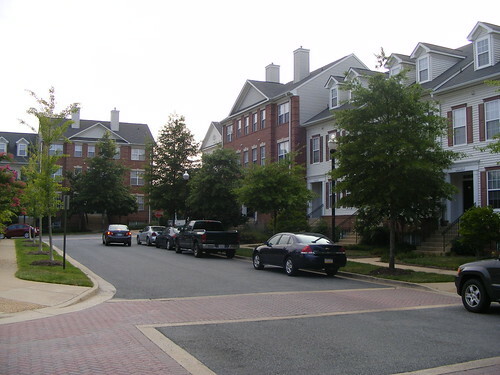 Arlington Square, an apartment complex in Arlington with stacked townhomes. New townhouses in closer-in, transit-accessible places like Arlington or Silver Spring can easily cost over $800,000. If stacked townhouses were allowed in townhouse zones, builders would be able to provide a more affordable alternative that still blends in with existing neighborhoods. Stacked townhouses at Jackson Place in Brookland. Photo by Jonathan Neeley. That's basically how zoning works in the District. Areas zoned for rowhouses usually allow apartments too (with some exceptions). As a result, you can find stacked townhouses at Jackson Place, a new development in Brookland, and at another project under construction on Georgia Avenue in Takoma. Both locations are zoned for rowhouses. We need big apartment buildings, and we need single-family houses. But we also need meaningful alternative for any household that doesn't want an apartment or a detached house, especially in inside-the-Beltway, transit-accessible neighborhoods. Stacked townhouses could be one of them, if they were simply easier to build. In addition, noise and vibration separation must be well executed when the bedrooms of the lower unit reside directly under the living room of the unit above. I know that if some has moving night with surround sound blasting while folks below are trying to get to sleep, that's an issue. I see with one type at least, the parking problem of having a one car garage. Since families may often have the need for two to shuttle kids. Morning drop off by one parent and evening pickup by the other make street parking a must. And if all the stacked units are of sim demographics the parking situ gets tough quickly. This type of housing is common in San Francisco. Buildings going back to the 1880s are often "stacked townhouses." My home is a 1600 square foot 1912 full floor unit with its own entrance and a big garden which is shared with two other similar units in the building. We call these "flats" as opposed to "apartments" which are usually accessed of a common space or hall, and are just part of a floor. Since most SF buildings are build from old-growth redwood, there is some noise leakage from other floors, but mostly footfalls and squeaky mattresses. But one gets used to this, and it's comforting in a way to feel like part of a big family made up of three families. This is a very nice way to densify. I recommend it!